Pick up the pace with the fastest cycle time in the industry! The Ranger Retrieval System provides unmatched productivity for linear-feed saws. Each system is built to order, and can be customized to suit your plant layout and production flow. Acer offers a flexible range of standard and optional features that maximize the efficiency of the Ranger RS in your facility. The illustration below shows the smallest and most basic system. Choose from vacuum board pickup or our patented screw pickup system. Our proprietary vacuum pickup system was designed from the start for handling lumber, and is built in-house to ensure quality and reliability. Perimeter safety system with light curtains and photoeyes utilizes a powerful spring brake chamber to stop the trolley rapidly in an emergency. Designed to handle inch or metric lumber in lengths from 6'--20' (1.8m--6m) long and sizes 2x3--2x12 (35 x 60--35 x 300mm) as well as engineered lumber. Rigid overhead truss design for spans up to 100' (16 stations). Large diameter ball-bearing trolley wheels run on 4"x4" steel guide rails for ultimate reliability and economy. LightSpeed lumber scanning technique uses a precision laser sensor to locate lumber automatically. Patent pending. Infeed deck holds up to 12--2x4s in queue, and operates independently of the picking head, allowing continuous feed to the saw while restocking lumber. Robust control system with rugged induction motor drives. No expensive specialized servo motors. Available Selective Crown Orientation automatically measures crown and orients boards properly for sawing. Patent pending. Available Dual Delivery option provides two independent picking heads on one trolley, capable of picking boards from two different stations and delivering them in one cycle. Patent pending. Optional Center Feed saw placement puts the saw in the middle, shortening delivery time on long systems. Patent pending. Choice of Vacuum or Screw Pickup! Acer began testing screw pickup and vacuum pickup systems in 2008 during the original development of the WoodRunner lumber retrieval system. Both methods have their merits, so we give you a choice. Our patented screw pickup system is a proven performer, while vacuum pickup is preferred in some plants, especially when handling engineered lumber or appearance-grade material. 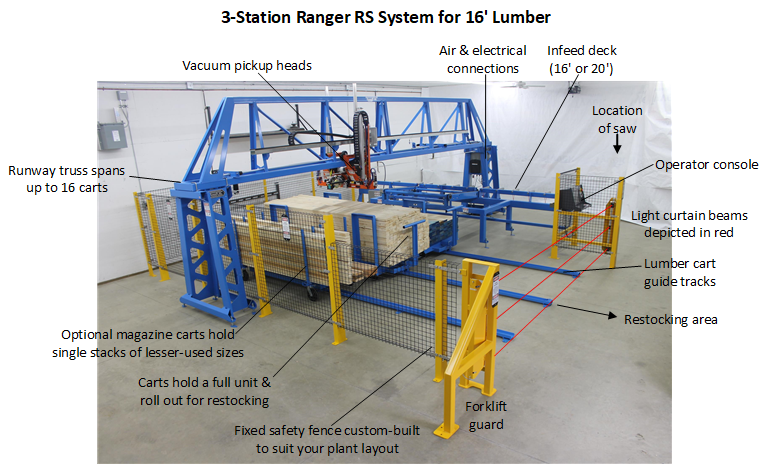 We designed and built our own vacuum system optimized for handling lumber. Acer is uniquely able to offer both vacuum pickup and screw pickup systems to our customers. Ranger RS is a trademark of Acer Inc. Ranger RS is protected under patent # 8,960,244 and other patents pending.